In 1928 Dr. Will Nichols bought the Samuel H. Bradley house at 60 South Public Square, built in 1856, and moved the house to the south adjacent lot at 209 South Broadway Street. Since 1978, the house has been renovated into Professional and Law Offices. 1. Jeffrey Bramley purchased the house and property from Eurie and Stanberry Nichols in 1981. 1. Jeffrey Bramley sold the property to Lee T. Skidmore in 1990. 1. Mary Jo Ciccolini, spouse of James F. Ciccolini purchased the property from Richard J. Marco, etal in 1995. 2. James F. Ciccolini acquired the property from Mary Jo Ciccolini through certificate transfer in 1999. 1. James F. Ciccolini transferred the property by certificate transfer Andrew Ciccolini in 2013. 1. In the early 1800’s Medina looked vastly different than it does today. One glaring difference is the square. Today, 210 South Broadway Street is home to Medina’s beautiful public library. But in the 1800’s, it was home to something very different. It’s a house, in fact. But not just any house, this was a mansion, even by today’s standards. 2. Built in 1833 by a wealthy merchant named David King, the house was modeled after America’s very own White House. David King was one of the original investors in the Connecticut Land Company, which owned all the land in the Western Reserve. His land investments were in Medina, which is why he came to Medina, already with an extreme amount of wealth. While he lived here, he sold pork and liquor out of the South West corner of the square, which is today home to the popular frozen yogurt establishment, Lemonberry. On top of all of this, he was also, in a way, one of Medina’s first banks, by loaning out money here and there to people who needed it. 1. 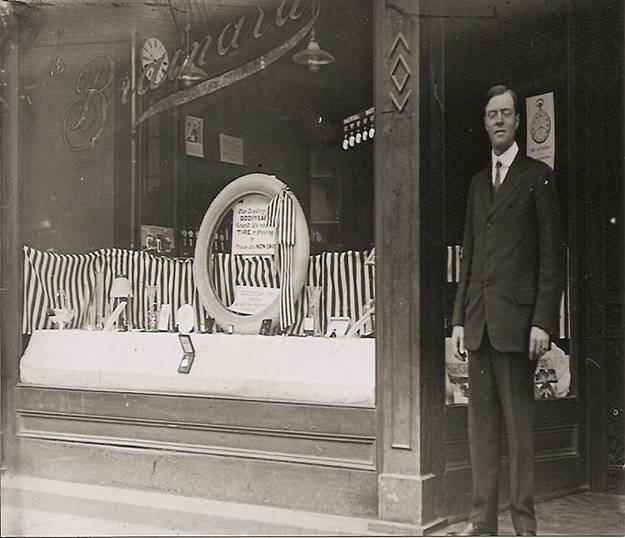 A. R. Whiteside came to Medina Village in 1830 from Pennsylvania and was a Dealer in stationary, wall paper and window shades and his store was located one door east of the Phoenix Block in 1848. 2 A. R. Whiteside assumed the duties of the first Village Fire Warden in 1871 and was responsible for the first cisterns to be dug around the Uptown Park. 1. In 1895 the house was purchased by Fremont O. Phillips, a leading citizen in the village. A self-made man, Phillips started out as a teacher and eventually became a lawyer, mayor of the village, U.S. Congressman and probate judge. 2. In 1905, Phillips decided to leave the Square — but not necessarily his beautiful, stately home. His reasons are not known. Perhaps the Square had gotten too noisy and commercial. At any rate, he sold the prime lot to a local cattle dealer, Franklin Sylvester, who wanted to achieve immortality by building a library for Medina that would bear his name. 5. The house was then sold to a man named Edward Deibel, who owned it for about 50 years, into the 1960’s. 6. Unfortunately, come the 1990’s the house was embarrassingly neglected by the man who owned it after Deibel. It had detreated so badly during the time that the entire front of the house almost literally fell off. 7. Thankfully, Ed Deibel had a grandson who took particular interest in saving this house. After the owner let it almost fall apart, it was put up for auction, and bought by Deibel’s grandson, Jim Gowe, who now owns the house and has restored to its former glory. 8. Driving on North Broadway, this house is even by today's standards, massive. You cannot even see the house's "L" shape from the street. You probably would not even guess its age, considering that it is an astounding 181 years old. Today, it looks just as good, if not better, than it did when it was brand new, thanks to renovations done by its owner, Jim Gowe. 9. The Fremont O Phillips House on North Broadway Street as it appears in 2016, 112 years after it's move from Public Square. 1. A Medina Circulating Library Association was formed. Members paid dues and then were able to check out books. 1. Miss Meroa Andrews, besides carrying on her jewelry store, stored the library books and acted as Librarian at a salary of $20 a year. 1. Herbert H. Brainard was elected the first President of the Medina Circulating Library Association in 1878, perhaps because he agreed to store the seventy library books in his jewelry store. 1. W. H. Albro, Druggist, provided a reading room rent free on the second floor to be used as a library. 1. A small building is bought in 1899 by the Library Association to house the library. 2. F. M Branch purchased the lot and building in 1907 for $1.500. 1. Medina Library Association moves to a room rented from Judge Barnard in 1900. 2. Librarian Miss Eva Johnson reports an average of 27 visits a day in 1905. 3. 1904-The Librarian’s salary increased to $3 a week and the library is to be open from 1:30-5 p.m.
1. Franklin Sylvester gives $10,000 for a public library and asks the trustees to make it a free public library. 1. 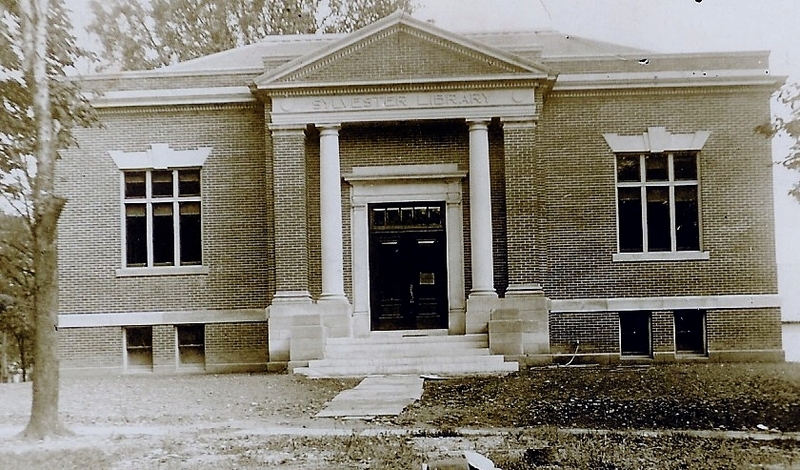 In 1933 Sylvester Library became a county wide public library and extended borrowing privileges to all of Medina County Residents. 1. In 1976 Dr. Mansell’s residence was razed and the size of the library was doubled. 1. Renovations have taken place in 1958, 1976 and 2008 to improve and enlarge the library facilities. 2. In 2005 a major expansion project was began and the library was enlarged to its existing size. 3. 2007 was the 100th Anniversary of the Franklin Sylvester/Medina County District Library. 2. 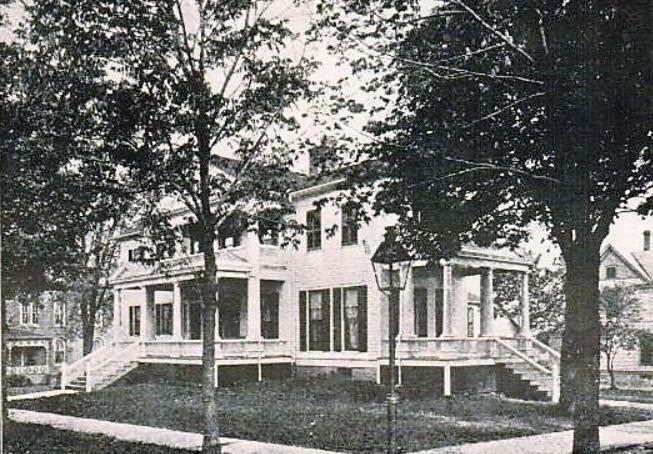 George J. Damon built a two story duplex style house in 1906. 1 In 1931, George S. Mellert, President of Free Oil Company bought the old George J. Damon property between his home at 218 South Broadway Street and the library and will remodel and improve the property. 1. In 1932, Dr. R. L. and Kathryn Mansell purchased the house and part lot 46 on Land Contract to 1937. 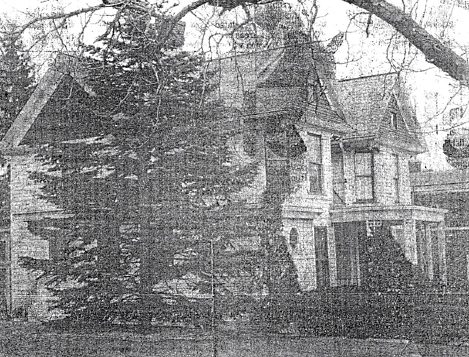 Dr. R. L. Mansell property was purchased by the Medina County District Library in 1976. 1. C. K. Steinle purchased part lot 38 from Jeffrey S. Pierce in 1918. 1. Mrs. Arvinne House bought the property from Christian Steinle estate in 1940. 1. In 1959 the Arvinna House house was raised to provide a private parking lot for Medina County Gazette and Nichols Dentistry customers. 2. The Seth Ault estate heirs sold the property to Eunice Ferguson in 1914. 1. Eunice Ferguson sold the property to Winnie Beck in 1917. 1. In 1917, John Beck bought the property, a duplex house at #217-219 South Broadway Street. 2. John Beck was a music teacher and had a studio in his home; was an organist in the Methodist Church and in the Princess Theater for many years. 1. Lloyd Fisher will have his Insurance office in the piano studio in 1929. 1. John Beck’s daughter Alice L. and Paul Raymond Ashley married and moved here in 1935. 1. John and Winnie Beck sold the property to Dr. and Effa Robinson in 1941. 1. The seven room rental house with four bedrooms, a slate roof and garage was sold by owner, Dr. H. P. H. Robinson to Carrie and Ray A. Shaw for $4,000 in 1943. 1. The Mansell properties were raised to provide an expansion to the private parking lot to the north for Uptown Merchant use in 1969. 2. Edith I. and George Silvan Mellert, President of Mellert-Weidner Company garage was destroyed by $20,000 fire, including 7 trucks and automobiles in 1922. Garage was located at rear of George Mellert’s home at 218 S. Broadway. 3. In 1922, Mellert-Weidner Company new fireproof garage 58’x 90’ was built by them with Omar L Shaw as Superintendent of Construction. 1. In 1967, Raymond and Madeline Mellert heirs to the George S. Mellert estate acquired the property by certificate transfer. 2. In 1969, Raymond Mellert sold the property to Dr. R. L. Mansell. 3. 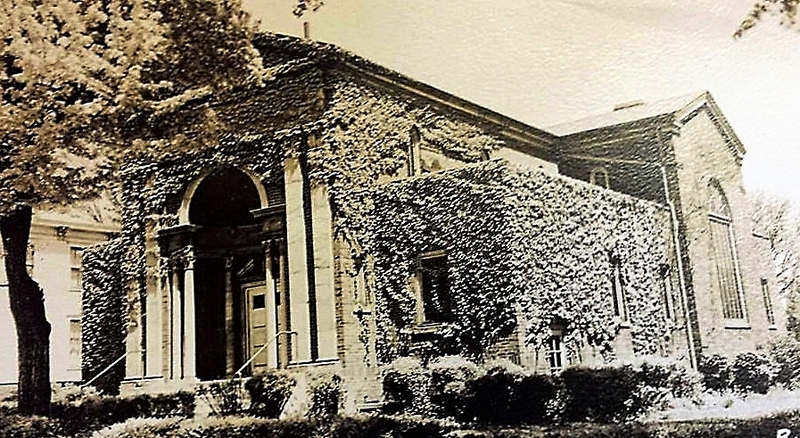 The Mansell property was purchased by the Medina County District Library in 1969. 1. Organized in 1877 by Evangelist Thomas D. Garvin, incorporated in 1878, the congregation met for three years in the Union Hail, Phoenix Hail, and Court House and in the Congregational and Baptist Churches. 1. 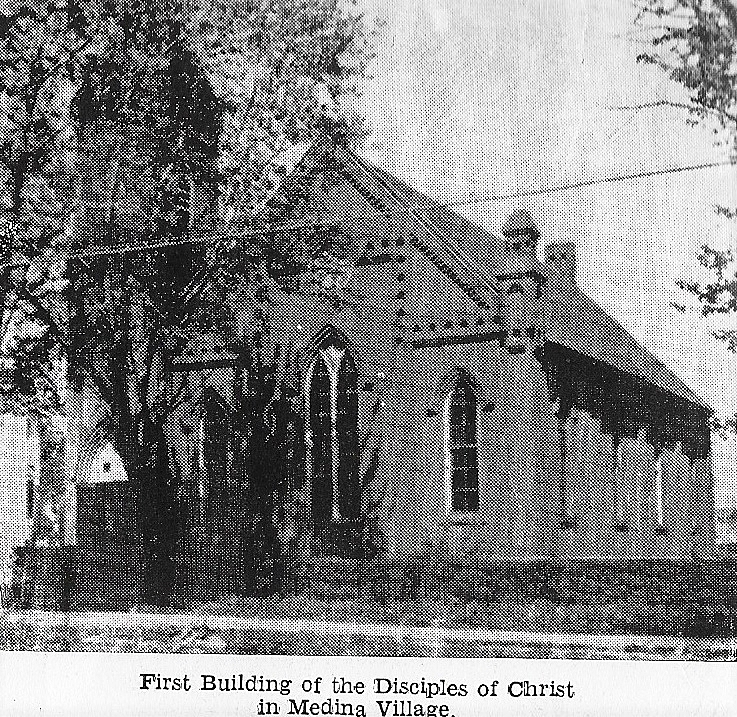 The old framed Disciple Church which stood on the site of the present church was built and dedicated in 1880 at a cost of $3,500 without indebtedness on the current lot. It was at the time the best church building in town until the Congregational Church built a larger and costlier one 1883. The lot was purchased at a price of $500, while the pews, which are still being used, were carved by hand by Ira and Floyd Bennett. 2. Dillon P. Clark was the Medina architect of The Disciple's meeting house in 1880. And it was frescoed by Mr. Kimmer of Cleveland. 3. The building was dedicated with great ceremony by T. D. Garvin, of Columbus, the founder of Wilmington College in Ohio. An Interesting incident connected with the dedication was recalled when a beam bearing the name of James A. Garfield, who was 20th president of the United States in 1881 was found when the building was torn down in 1923. Garfield a Disciple minister before entering politics was invited to attend the dedication but, was unable to attend because of the press of business in Washington. However, at about this time he did pass through Medina by train, and his proximity must have prompted one of the workmen to inscribe his name upon the piece of timber. 1. The Disciple Church has a new metal ceiling by Oatman Brothers Hardware and varnished woodwork and seats with painted walls in 1904. 1. Rev. Vernon S. Goodale baptized children in a building called the “Mengus Temple” that sat just south of the Disciple Church on South Broadway Street near where Garfield School was built in 1911. 1. In 1923, the old church was moved to 570 South Court Street and a brick structure was erected for $30,000 in the cruciform, colonial style exterior and dedicated in 1924. 2. Architect Paul Tresler Cahill of Fulton, Taylor and Cahill of Cleveland designed the red brick church with a slate roof and sandstone trim. 1. In 1957, a new educational wing with class rooms and offices was added, bringing the building to the current size. 2. In 1957 the Church constitution was adopted and the name was changed from the Disciple Church to the First Christian Church of Medina. 2. In 2003, a new much larger church was built at 4797 Sharon-Copley Road in Montville Township to serve a growing congregation. 1. New seven room house built by Clarence Bair and Frank Water in 1917. 1. The Berry house was separated from the Swift and Bagley house by a paved concrete alley with easements for use by both residences and the businesses in the building behind them on S. Court St. just north of the Methodist Church now occupied by Castle Noel. 3. Hatch Dairy moved office here in 1948. They will no longer do their own processing. 4. Dudley H. and Iola J. Bagley sold the property to Kenneth G and Pamela O. Whitehill in 1993. 5. Dudley and Iola Bagley sold the residence to become an antique store and moved to Malloy Court after they both retired. 1. In 1994, Ralph Jocke and Patricia Walker purchased the property. #225 combined with #231 in 2004. 1. Judge Graves purchased the lot 39 from Aaron Pardee in 1885. 2. 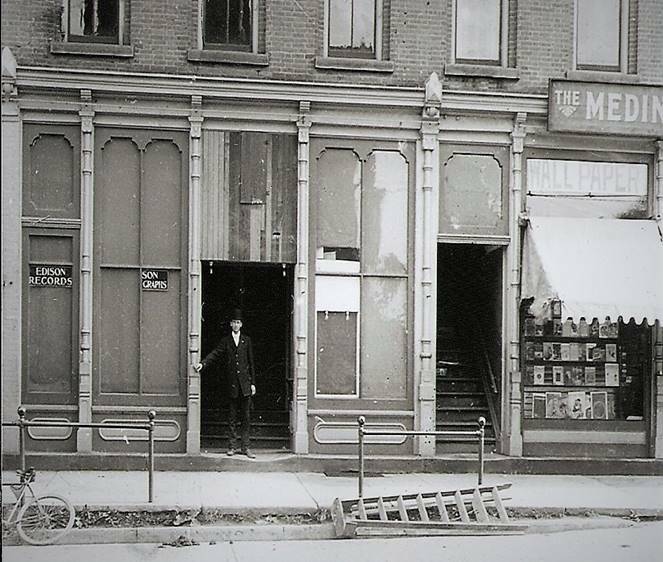 In 1916, lived alone, took meals at White Front Restaurant. 3. Judge Graves returned from dinner and sat down at the fireplace in his hat and coat. He had a heart attack; parts of his body were charred and the chair would have combusted soon. He died in 1922. 4. John Graves came to Medina in 1846. He attended S.G. Barnard’s Normal School and was a teacher at age 18, Civil War veteran; admitted to bar in1871; Solicitor in 1894. 1. W. E. Griesinger purchased the property from Judge Graves in 1917. 1. L. E. Ball purchased the property from W. E. Griesinger in 1921. 1. Bertha Neumeyer purchased the property from Lewis E. Ball in 1925. 1. Berry father and two son’s families shared the residence from 1940 to 1985. 2. Boyd and Thurston Berry acquired the property in 1979 from B. L. and Delpha Berry reserved for life use. #229 was combined with #225 and #231 in 2012. 1. Charles Winters built the house in 1917. 2. Charles Winters sold the property to T. J. Weidner in 1920. 1. V.G. Kirby moved into the Weidner home vacated by the Hess family in 1935. 1. Howard E. and Mary Claggett purchased the property from T. J. Weidner in 1938. 2. Howard was a teacher and the Principal of Medina High School and also wrote a weekly column for the Medina County Gazette called by his initials “By H.E.C.”. 3. Mary Claggett taught elementary school in Medina for many years. 1. Harry E. Van Horsten purchased the Howard E. Claggett property as executor of the estate in 1986. 1. Harry E. Van Horsten sold the property to Ralph E. and Patricia Walker in 1989. #234-250 South Broadway Street: Garfield and Lincoln Bldgs. Center Union School. — North east corner of South Broadway Street and East Smith Road, J. McCormick, Principal, Miss Ellen Warner, Assistant. East Primary School.— South east corner of Harmony (East Alley) between East Liberty Street and East Washington Street, Miss Hattie Loring, Teacher. 1. W. H. Sipher was born in 1859 and attended the East Primary school in 1866. 2. In 1872, Dillon Clark will convert the East schoolhouse into a fine new home. 3. In 1874, East Primary school bought by Chamberlain and converted into a cottage for L.F. Fassett. Center Primary School. — North west corner of South Broadway Street and East Smith Road, Miss Anna Sweet, Teacher. 1. Previous to the erection of Lincoln school in 1871, the high school and some intermediate grades were housed in Center Primary School, what is now the Stuart Hamilton residence. 2. In 1895, the old Center Primary School house at corner of South Broadway and East Smith was moved up the street and turned into a residence by George W. Rickard, George W. Rickard died at his home in 1921. South Primary School.— South side of East Lafayette Road (Harrisville Road), between South Court Street and South Broadway Street, Miss Reliance Babcock, Teacher. 1. The only buildings on the east side of South Court to Wadsworth Road were a schoolhouse and the Methodist Church and Dan Ainsworth’s pasture. D.A. lived in S. B. Woodward house on west side of South Court Street and had a livery stable and stage route in the 1860s. North Intermediate School.— South side of North Street between North Broadway Street and North Court Street, Miss A. Blakeslee, Teacher. Normal School,-- North side of Lafayette Road (Harrisville Road) between South Court Street and South Broadway Street, S. G. Barnard, Principal. 1. In 1854, the school house where Caswell and Gunkleman wagon shop now stands was a remodeled Methodist Church with pews as seats and was directly across street from the present site of the South Primary school. 2. In 1871, the old Center Union School building was moved to become the new Norman School Boarding Hall. 1. Medina Gazette Editorial-1870: "There is no place in the state of Ohio of the same population where the taxes are as low as in the village of Medina. We have a population of from 1,500 to 2,000 people, who are among the best people in Ohio. Our corporation taxes for the past year have been only one mill on the dollar. Where is there a parallel to this in the state of Ohio? It is true that by reason of three bridges that the corporation had to build, the taxes were not quite sufficient to meet all the expenses, but the debt of the village on the first Monday in March, 1870, was only $155.74. Who, with these facts before them, will say, that the people of this village can't build a school house worth $20,000. 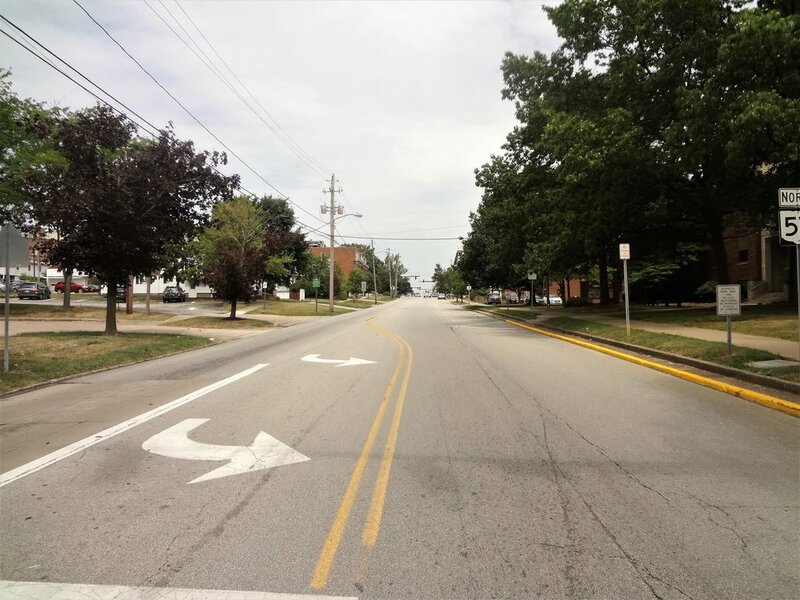 The taxable Property on the duplicate for the village is about 3,350,000, and under the new assessment will be $500,000." 2. Dr. S. J. Smith and Mrs. L. Bingham sold lots for $1080 to Board of Education opposite centralized school for a new High School in 1871. F. J. Wheatly bought the old schoolhouse. 3. A new 2 story, brick High School was built by John Rounds Company for $14,000 with 61 windows, $20,000 of iron and a tin roof built by Sanders and Sturgis in 1871. Bricks were made at the Samuel Hale brick works 4 miles west on Smith Road. 4. The schoolhouse bell was an old bell from the Medina County Court House. 5. The Medina School Board bought the E. B. Spritzer property just east of the of the High School and barn in 1910 for future athletic field. 1. High School age students were transferred to the new High School on North Broadway Street in 1924 and Lincoln School became a grade school only. 2. In 1949, Lincoln Grade School was demolished to make way for a new building to be attached to the present Garfield Grade School at a cost of $550,000 to provide for an expanded Elementary School facility. 1. Garfield School was built in 1911 with concrete foundation and brick walls. Excavation by W.J. Anderson, contractor E. E. Bope, Frank Gruninger architect and U. S. Rowe is construction foreman. The new Garfield Grade School opened in 1912. 1. The Medina County Historical Society must leave the Garfield building because the room is needed for a school library in 1942. 2. Garfield School provided educational facilities for 5th through 7th grade students for many years. 3. In 2017 present enrollment is 370 students from Kindergarten through 5th grade. .Miss Ella Canavan (1878-1964) Her dedication to teaching and encouraging literacy is a legacy that lives on in Medina today. 1. Ella Canavan was born in 1878, presumably in Medina. She attended local school and was educated at Oberlin College until 1899, and then began teaching in 1900. 2. “Miss Ella” was unconditionally loved and respected in Medina and remains to this day, long after her death, an integral part of education in Medina. 3. “Miss Ella” was a friendly face to every student who walked the halls of the Lincoln Building and eventually of Garfield Elementary School. The echo of her ringing bell rang merrily across the playground to signal the start of class. 4. Her first "school" was at Ben Water’s house in Medina, and it was this school that established the private kindergarten system in the area, her first class having an enrollment of 30 children. 5. Miss Ella was the definition of passionate about teaching. She even taught for five years without pay before kindergarten was a part of the school district. 6. In 1905, kindergarten became part of the Medina City School District, and Miss Ella’s classes were moved to the Lincoln Building on South Broadway Street. 7. Because of crowded conditions, the Lincoln Building also serving all twelve grades at the time, “Miss Ella” moved her classes to the Odd Fellows building on Public Square, where she remained until the kindergarten was removed to the old Garfield School building in 1916, where Miss Ella would remain for the rest of her career. 8. She resigned in 1945 after 45 years of distinguished service in Medina. 9. 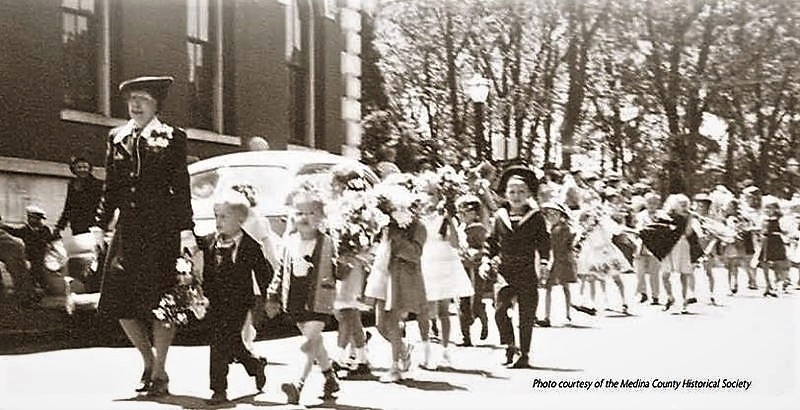 On October 9th, 1960, the citizens of Medina gathered in celebration of the beloved Miss Ella Canavan, and the brand new school building that was about to be named after her. She already received a congratulatory letter from President Eisenhower in recognition of her 45 years of teaching, so this great honor was the icing on the cake for Miss Ella. 10. Ella Canavan Elementary school was dedicated in her honor, and she passed away shortly after on May 4, 1964. "Miss Ella" wan a special sort of a person to between 1000 and 4000 men and women who started their schooling under her during the 45 years she taught kindergarten here, for she was the embodiment of patience understanding and kindness — qualities which quickly cemented a strong bond of affection and trust between pupil and teacher. And the bond was a lasting one. "Miss Ella’s" rare combination of qualities invariably left a deep imprint on the young minds in her care, her influence having taken on extra strength and meaning, instead of waning, as the years brought to those developing minds a greater appreciation of the verities. Furthermore, "Miss Ella's" genuine interest in her "children" was unending, their progress through the grades to graduation and their life confrontation after their studies were ended having held her attention to the last. Having Inns served in training the young for 40 years both as a kindergarten teacher and principal, "Ms. Ella” entered well-deserved retirement in 1945. But her departure from the classroom did not make people forget and when a new elementary school was opened in the southwest sector of the city in 1960, it was named after her in recognition of her accomplishments while she was still alive to accept the honor. It was a fine autumn day nearly four years ago when the school was dedicated to her. "Miss Ella." in the presence of many of her former pupils, accepted the tribute in her typically modest way and with a courageous show of physical strength which clocked the failing health which had befallen her. It was typical of her. A new school had been dedicated to her, which was only a natural sequence. For in the words of Rev. Fr. Robert E. Murphy, who conducted last rites for "Miss Ella" in St. Francis Xavier Catholic Church Tuesday morning. "Her's was a dedicated life ... to teaching, besides the A, B. C.*s, the virtue*. "She ‘has placed herself in the archives of this town forever," Fr. Murphy went on to say, "through her simple life, kindness and love, because of her efforts." her priest went on to say, "Almighty God must be pleased with her." 1. Ida M. Hauck, heir to the estate of Ernest Hauck sold part lot 40 to George Codding in 1915. 1. In 1916, George Codding built a house on part lot 40. 2. George Codding is crossing tender at Northern Ohio Railroad on S. Court Street in 1920. 3. Women’s KKK meets at Lionne Codding’s house from 1927 to 1929. 1. Katherine and Ernest G. Hauck built their new residence and tailor shop in 1904. 1. In 1959, the United Methodist Church purchased the property and raised the house for a church parking lot. 1. In 1933 Rufus Ferris sold the lot 40 to the Medina Village School District No. 1. 1. F. J. Wheatley sold the old school building to George W. Rickard in 1895. 1. The old central schoolhouse at corner of Broadway and Smith was moved up the street and turned into a residence by George W. Rickard in 1895. 2. 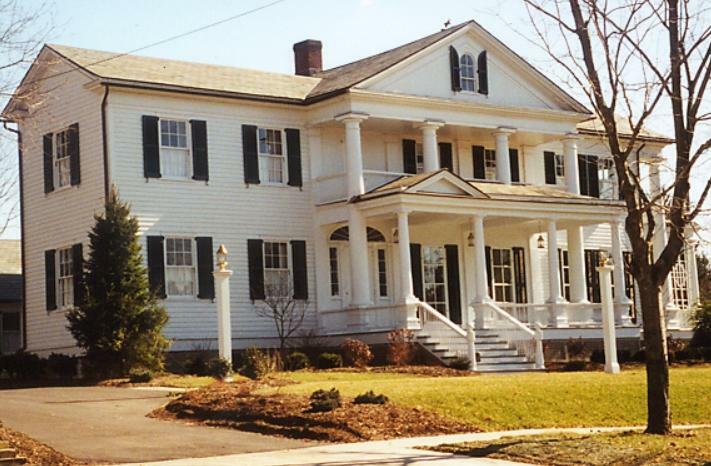 The Hamilton house was raised in preparing for the new Nichols Dentistry building in 1962. 1. Dr. Nichols moved here from 56 South Public Square in 1963 and built a new, modern Dentistry facility. 1. A family dentistry that has served Medina clients in and around Public Square for over 135 years. 1. An ashery stood on the banks of Champion Creek on South Broadway where Clement Cement Company now (1923) stands. It was ramshackle building, made of the cheapest lumber slabs. The building contained a row of cauldron kettles set deep in the floor in which potash was boiled into lye then made into soap. 2. Harrison G. Blake was the principle owner. It was the largest enterprise in Medina then employing a number of men at the plant and others bringing in the ashes. He sent half a dozen teams over the town and surrounding counties to bring in the ashes. 3. The old ash man would come in with his bucket, proceed to the back of the house where the ashes had been carefully stored in old buckets, measure them up and carry them up on his shoulder and dump them into his wagon. Then mother would go out and get her “pay”– not in money but in groceries, dry goods or notions from the wagon. Mother selected pay for her ashes, which brought anywhere from six to 10 cents per bushel. 4. Then the grimy old ash man would mount his seat and with a "good-by” and “giddap” with a slash of the whip to wake up the poor sleepy old team who looked and acted as though they had not seen an oat or a curry-comb since the election of Harrison, and then the old ash man would proceed on his weary round. 1. Samuel Andrew was in Medina from 1852 to 1897 and owned an ashery where South Broadway crosses Champion Creek. Bob, I found this really interesting. I know that an ashery was where they made charcoal. Everyone hated the Asher man because he was permanently filthy, he was mean from staying awake around the clock when he was firing to control the air to the wood so that it didn't burn away (or cause a fire), and he would cut your trees and even whole orchards when he was out of wood. There were asheries in Chatham and Granger. Evidently the Medina asheries were where they made soap from the by-product of lye rather than charcoal. An 1835” Ohio Free Press and Medina Co Advertiser”, the oldest known Medina paper, has an ad for Oviatt and Bronson asheries and general store. 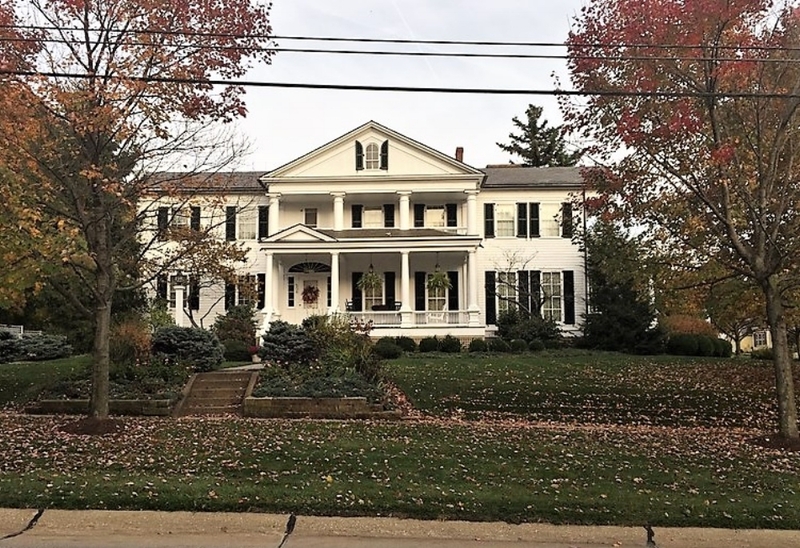 Location is unknown, but there were asheries on South Elmwood Street on the south side of Champion Creek in 1840, including an ashery owned by David King, prominent Medina businessman. Now dear readers go back with me to the old “ashery”. It was considerably past midnight when we arrive. We find Robert and Jerome Bean on watch, it being the custom for two of the day hands to stand watch through the night, to care for everything about the plant, but mainly to keep the potash boiling. Robert the older of the two, feeling sleepy (both having worked hard the day before) went into an adjoining room or shed to take a little nap, leaving Jerome alone to watch the boiling potash. Now, in some unaccountable manner, it seems he must have fallen asleep while walking around the kettles. Anyhow, Robert was aroused from his sleep by an unearthly scream, and rushing in he found his brother had fallen it to one of the kettles of boiling potash. He reached for him, pulled him out, carried him down to the creek and dipped him in the water. In doing this, he burned his clothing arms and hands badly. After leaving him in the water awhile, he took him out and carried him back to the plant and sat him down. “Now,” said Robert, “I will take you on my back and carry you home". Then on second thought he said, “No that would not do. We were left in charge of the potash and it would not be right for us both to leave.” “Yes,” said Jerome, “You are right and I am able to walk home alone”. Therefore, setting the action to the word, this 16-year-old boy, alone in the dead of night, with every vestige of his clothing burned from his body, and as it proved, dying, took up his march homeward with bits of burning flesh dropping from his body. Even the soles of his feet came off on the way which were afterwards picked up by a neighbor and carried to the Bean home. He arrived at his home, which was situated on West Washington street, just a little east of where Blake Hendrickson now resides, and knocking on the door called to his mother to come and let him in quick for he was burned to death. Dear reader can you imagine his poor mother’s feelings when on opening the door she beheld her boy standing before her, naked as the day he was born, and his body, a horrible sight, burned and disfigured almost beyond recognition by his own mother? But why torture you with further details of this terrible tragedy. Rather let us leave this poor unfortunate boy in the care of his heart-broken mother, and in the hands of his Savior; who after three days; suffering bore his spirit to that place of glory above, there to watch him tenderly, lovingly, until the judgment day. In closing this remarkable story of long ago, we remember as though it was yesterday standing at our grandmother’s knee and hearing her relate, amidst heart-breaking sobs, this terrible story, word for word, of the awful fate of her dead boy. Yes, Jerome Bean was a younger brother of Mrs. Lyman Oatman Sr. therefore an uncle of the writer of this article and of my sister, Mrs. F.M. Burdoin of North Court and Friendship Street. For a complete history of the Medina Village Water Works one would need to also review information at #126 West Friendship Street. 1. The village has been in the water business since 1882 when it’s first well and tiny pumping station went into operation on West Friendship Street. This plant was operated until shortly after completion of the larger plant on South Broadway Street. 2. By virtue of an ordinance passed by Council on Feb. 9, 1897, Burton J. Ashby, of Chicago, was authorized to furnish plans and to superintend construction of the new building at a cost of $395. 3. Before this building was constructed the waterworks was located on South Court Street near the present A. C. & Y. station. However, the water supply of the Shepard mill was of such high quality that it was decided to tap the same vein used by the mill, and the works was moved over next to it. 4. The source of supply for the new works was the one big well drilled at this location. William Smith, father- in-law of "Cap" Schuler, was superintendent. 5. On April 30, of the same year, bids for construction were let. George Gruninger was authorized to build the works for $1,157 while the Warren City Boiler Works made a low bid of $2,598 for the standpipe which stands behind the present waterworks office. At the same time bonds were issued for $8,000 to provide for the total construction of the new water system. 6. The pumping station, together with a 90-foot high 100,000 gallon water storage tank built on West Friendship Street cost the city fathers $8625. 7. In 1897, Wood water pipe was laid from the pumping station on South Broadway Street at Champion Creek north through Public Square to the new standpipe being built on West Friendship Street. 8. In 1897, N. H. McClure was mayor of Medina. Members of the council were W. E. Griesinger, George F. H:gh, J. A. Hobart, Lyman Oatman, E. R. Root and P. N. Yoder, Hiram Goodwin was clerk. 9. An interesting notation in the same minutes of the council in which Ashley was authorized to draw up plans reads as follows: "On motion the marshal was instructed to notify Mr. Reinhardt that hereafter in furnishing lunch for tramps; he shall furnish only a 10-cent lunch. 10. It was in 1907, 10 years after opening of the city's first modern water pumping and distribution system that a small plant was built on Co. Rd. 22 near Rock River, to supplement the downtown water supply and pumping facilities. Later the water works operation was moved out to Rocky River at its present location, the main building there having been constructed in 1916. 11. The Gazette and citizens, with pride and confidence in the village at the time were actively trying to bring in new industry. With completion of the new water system the year before in 1897, water from two deep wells, reaching a "copious vein," was being supplied to village residents and the fire department by a "handsome new brick pumping station" on South Broadway Street, having a capacity of 130 gallons a minute. 12. The eager Newsman, town booster and community optimist, in addition to promoting the village as something of a health spa, had high praise for the town's newly-completed waterworks system as one of the greatest. In a story in the same issue about the water system, the Gazette, in addition to praising the water's curative properties, pointed out that "no city or village of its size can boast of a finer water system for fighting fire than can Medina." 13. Medina has "pure and health- giving water from deep wells in abundant supply." The water is "remarkable for its great medicinal qualities." 14. "The high altitude of Medina and generally healthy surroundings make it an ideal spot for permanent residence and those seeking recovery from chronic ailment". So said a headline writer 66 years ago in a special industrial edition of the Medina County Gazette dated May 26, 1898. 15. The eager Newsman, town booster and community optimist, in addition to promoting the village as something of a health spa, had high praise for the town's newly-completed waterworks system as one of the greatest. In a story in the same issue about the water system, the Gazette, in addition to praising the water's curative properties, pointed out that "no city or village of its size can boast of a finer water system for fighting fire than can Medina." 1. Medina village council sold the old water works building on lot 63 near rail-road tracks to Willard Nugent for $1502.50 in 1909. 2. Willard Nugent sold his building and part-lot 63 to William A. Clement in 1911. 3. 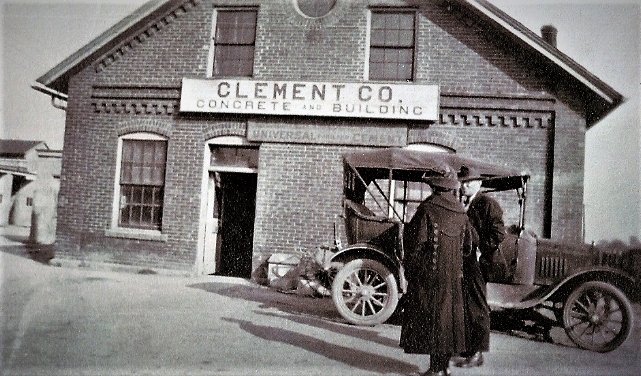 Clement Concrete Company, a construction and concrete works established by William A and sons R. L. and E. M. Clement in 1911 made more than 60,000 cement blocks per year. 4. Clement Concrete Company who employed 15 employees also built concrete building, roads and bridges. 5. The pound for stray cattle was a small fenced square of land near the site of Clement Concrete. 6. Pictured here is the old water-works on South Broadway Street at the A., C. & Y. tracks which is now occupied by the Clement Company. In the rear may be seen the old Shepard mill which burned to the ground a number of years ago (in 1917) and has since been rebuilt and is now used by the Farm Bureau. 1. Clement Company leased the business to John F. Moxley of Medina Supply Company after 30 yrs in business. 2. Brothers Elbridge R. and John F. Moxley founded Medina Supply Company in 1941 and operated their concrete business at the old Clement Concrete Company building on South Broadway Street. 3. Medina Supply Company owned by the Moxley brothers moved to the Paul Anderson barn in 1943. 1. Dowell Chemical Company operated a fleet of trucks and did industrial equipment cleaning in large factories in Northern Ohio area. Medina Supply Company Storage Building, John Moxley and Elbridge Moxley, Props. 1. Entrance to South Broadway Street a sealed access.